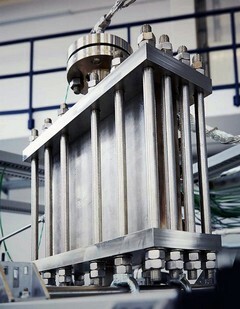 ProCone provides a chemical reactor unit based on the Fischer-Tropsch (FT) synthesis principals for the conversion of synthetic gas (SynGas) to liquids and paraffin wax. The liquids produced include diesel, jet fuel and much more. The paraffin wax produced is of high purity. The advantages of the FT synthesis unit used by ProCone is the advanced and cutting edge technology and method to deliver a very compact unit. This also leads to a significant reduction in manufacturing and operating costs. In addition the Fischer-Tropsch synthesis allows a dynamic and load flexible operation. The high efficiency of the conversion units is not only a more economical unit as conventional FT synthesis equipment, but also requires much less of a footprint at the facility, less start-up time, less maintenance time and therefore less downtime of the operation. See below the advantages of thermo-chemical conversion using the FT synthesis unit to convert the SynGas into valuable liquids, for example, SynFuel and paraffin wax. Compared to conventional diesel, various kinds of regulated and non-regulated pollutant emissions are reduced with the engines using FT fuels: HC, CO, NOx, PM, SOF, VOF and PAHs. FT diesel has excellent cold starting properties, and cold start versus hot start tests show larger emission reductions for cold starts. More aggressive and more urban-like driving cycles lead to larger reductions with FT diesel, relative to conventional fossil diesel. The conversion of biomass with the FT synthesis unit used by ProCone and the use of the liquid produced, reduces the emissions of greenhouse gases by 60 – 90% compared to fossil liquids.